This Husky 2nd Floor liner fits your 2003-2009 Dodge Ram 2500/3500 Quad Cab Pickup. Ram 1500 applications also (see product details inside). This Husky front floor mat fits your 2012-2016 Ford 6.7L Powerstroke F250/350 and 2012-2015 F450 SuperCab or CrewCab pickup which has a drivers side foot rest but is not equipped manual transfer case shifter. This Husky front floor mat fits your 2011-2016 Ford 6.7L Powerstroke F250/350/450 SuperCab or CrewCab pickup which does not have a drivers side foot rest or a manual transfer case shifter. 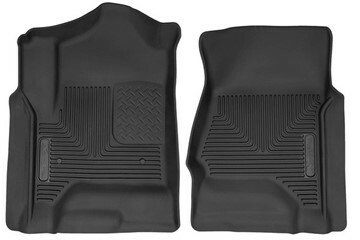 These Husky front floor mats fit your 2009-2014 Ford F150 Standard/Supercab/Supercrew pickups which aren't equipped with a manual transfer case. This Husky front floor mat fits your 2010-2018 Dodge Ram 2500/3500 Crew Cab & Mega Cab Pickups equipped with an Automatic Transmission. Ram 1500 applications also (see product details). These Husky front floor mats fit your 2003-2018 Dodge Ram 2500/3500 Standard Cab or Quad Cab pickup equipped with an automatic transmission. Ram 1500 applications also (see product details). Auto Trans only. 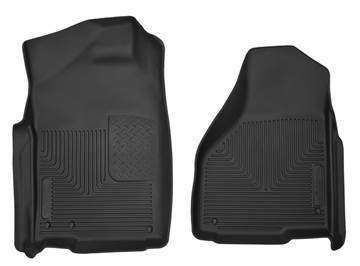 These Husky 2nd & 3rd seat floor mats fit your 2001-2007 GMC/Chevy LB7/LLY/LBZ 6.6L Duramax pickup. A huge amount of other applications (mostly gas vehicles) are also supported (see product details inside). This Husky 2nd floor liner fits your 2015-2019 GMC/Chevy Duramax 6.6L LML/L5P Crew Cab pickup. Some GMC/Chevy 1500 applications are also supported (see product details inside). 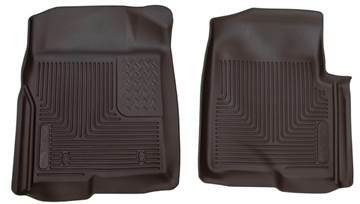 This Husky 2nd floor liner fits your 2007-2014 GMC/Chevy Duramax 6.6L LMM/LML Crew Cab or Extended Cab pickup. Some GMC/Chevy 1500 applications are also supported (see product details inside). This Husky 2nd floor liner fits your 2017-2019 Ford 6.7L Powerstroke F250/F350 Crew Cab pickups which is not equipped with an OEM storage box. Provides full coverage. 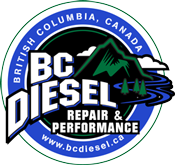 Also fits some F150 applications - see inside for details. This Husky 2nd floor liner fits your 2017-2019 Ford 6.7L Powerstroke F250/F350 Crew Cab pickups which ARE equipped with an OEM storage box. Fits with factory underseat box. 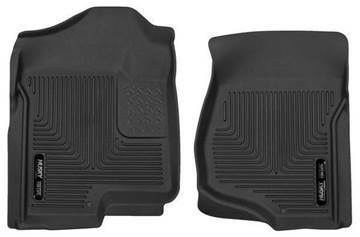 This Husky 2nd floor liner fits your 2011-2016 Ford 6.7L Powerstroke F250/350 Crew Cab pickup. This Husky front floor mat fits your 2007-2014 GMC/Chevy 6.6L LMM/LML Duramax pickup with a Crew Cab or Extended Cab. Some GMC/Chevy 1500 applications are also supported (see product details inside). This Husky front floor mat fits your 2015-2019 GMC/Chevy 6.6L LML/L5P Duramax pickup with a Crew Cab or Double Cab. Some GMC/Chevy 1500 applications are also supported (see product details inside). 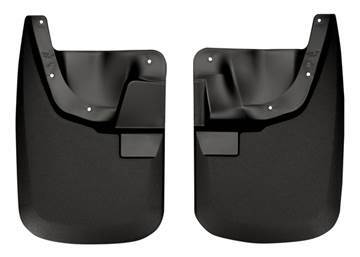 These Husky front mud guards fit your 2011-2016 Ford 6.7L Powerstroke F250/350 pickup which is not equipped with OEM fender flares. 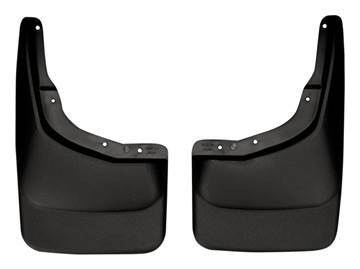 These Husky front mud guards fit your 2017-2019 Ford 6.7L Powerstroke F250/350 pickup which is not equipped with OEM fender flares. This Husky front mud guard fits most 2004-2014 Ford F-150 pickups that are not equipped with fender flares and running boards. See product for application details.